The great thing about Penny Penniworth, Chris Weikel's terrific parody of Charles Dickens' work, is that it's not much more outlandish than something Dickens would have written. This tale of Penny Penniworth, a well-bred young lady brought to poverty, who lost then found then lost the love of her life, all while working for a bitter spinster . . . well, you can almost hear Dickens nodding his head and saying, "I can work with that." 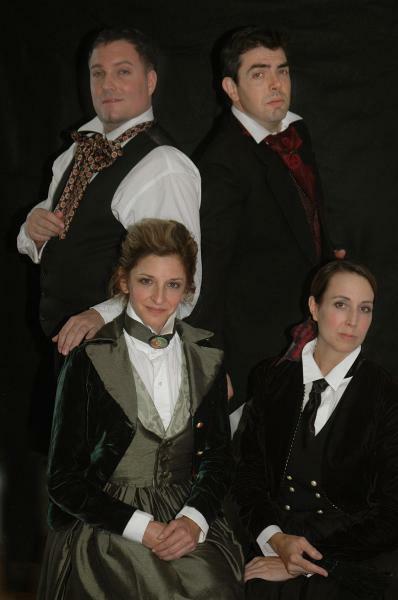 Weikel's play nudges all of Dickens' tricks - mistaken identities, orphan lads, fortunes lost and found, evil suitors, twins, grieving spinsters, great character names - and packs them into a tight, four-person play. Not that there are only four characters, of course. Penny Penniworth has more characters than you can shake a stick at, and watching the actors switch from role to role is half the fun. Jamie Heinlein is excellent as young Penny. One of the highlights of the show is watching Heinlein as the wonderfully-named Malodorous Dump kidnapping herself as Penny. Christopher Borg and Jason O'Connell each have many moments to shine as well, Borg at his best as Penny's fluttering mother and O'Connell as the villainous Rupert Stryfe, heir to the House of Stryfe, though it is Ellen Reilly who often steals the show. Her Ms. Havasnort (Penniworth's version of Miss Haversham) is priceless, as is her ever so formal solicitor, Mr. Bunting of Bunting, Bunting and Swag. Like The Complete Works of William Shakespeare (Abridged) before it, Penny Penniworth revels in its silly moments, and there are many. Mark Finley's crackjack direction keeps the comedy coming in waves; just as one breaks over the audience, the next is queuing up. While the technical elements of the show are all well done, the costumes by House of Goody are spectacular and really add a great deal to the show. Penny Penniworth has had several incarnations, so it's likely to make another appearance. That said, it would be hard to beat this particular production, so if you can tear yourself away from the marvelous weather, you should see one of the final performances. $8 Tickets to "Devil Boys From Beyond"